I see this hair and I just imagine the smell of hair relaxer coated on my sister’s hair. When my mother tried to relax my hair as a child, it fell out in clumps. She quickly decided my hair was too sensitive. It is. If I try to straighten it or color it, it breaks right away. I have to be careful just combing (never brushing) it. Apparently, Chris Rock is as obsessed with hair as I am. I spotted a clip from his latest documentary, “Good Hair” on antiracistparent.com. 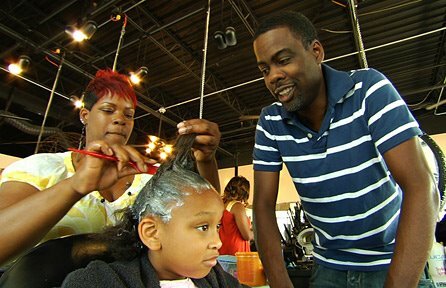 Rock decided to make the documentary after his young daughter Lola came inside from playing one day and asked him, “Daddy, why don’t I have good hair?” I can’t wait to see the whole documentary! Why have I always like Chris Rock?Well I guess now I know why.